Raleigh, NC (August 27, 2018) – Joseph U. Barker, MD of Raleigh Orthopaedic Clinic was selected to be a faculty member, speaker, and a laboratory instructor at a national hip arthroscopy course sponsored by Stryker Corporation in Las Vegas, Nevada. This was a 2 day course, which took place on August 17th and August 18th. The goal of this course was to teach orthopaedic surgeons from around the world how to perform advanced hip arthroscopic procedures. Dr. Barker was the keynote speaker on the topic of advances in hip arthroscopy with a special emphasis on the role of labral reconstruction and labral repair. The course included a day long cadaver laboratory in which Dr. Barker demonstrated advanced hip arthroscopy techniques including labral repair, capsular repair, labral reconstruction, treatment of gluteus medius tears, and arthroscopic treatment of femoral acetabular impingement. “It is always a privilege to be asked to teach surgeons from around the world the latest advances in hip arthroscopy including labral repair techniques, treatment of femoral acetabular impingement, and capsular repair", said Dr. Joseph Barker. Dr. Barker is current a team physician for the Carolina Hurricanes, NC State University men's basketball, and Broughton High school. 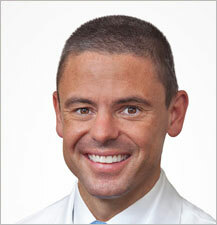 Dr. Barker is a fellowship trained orthopaedic surgeon in Sports Medicine. His areas of expertise include sports medicine, shoulder, hip and knee arthroscopy, and cartilage restoration. Prior to joining Raleigh Orthopaedic Clinic in August 2010, he received his medical degree from Duke University School of Medicine, where he was awarded a Howard Hughes Fellowship for his orthopaedic research. He completed his internship and residency at Cornell University/Hospital for Special Surgery in New York, and then was selected for a Sports Medicine Fellowship at Rush University Medical Center in Chicago. Dr. Barker has had the opportunity to train in hip arthroscopy under Dr. Bryan Kelly at Hospital for Special Surgery in New York, Dr. Tom Byrd in Nashville, and Dr. Shane Nho in Chicago, all of whom are national leaders in the field. Dr. Barker has also been recognized by The American Orthopaedic Society for Sports Medicine (AOSSM) for his basic science research on hip arthroscopy. The paper he co-authored was named the winner of the Aircast Award for Basic Science by the AOSSM. Dr. Barker has a clinical interest in the treatment of young adults with hip pain . For further details on Dr. Barker, please visit:Dr. Barker has had the opportunity to train in hip arthroscopy under Dr. Bryan Kelly at Hospital for Special Surgery in New York, Dr. Tom Byrd in Nashville, and Dr. Shane Nho in Chicago, all of whom are national leaders in the field. Dr. Barker has also been recognized by The American Orthopaedic Society for Sports Medicine (AOSSM) for his basic science research on hip arthroscopy. The paper he co-authored was named the winner of the Aircast Award for Basic Science by the AOSSM. Dr. Barker has a clinical interest in the treatment of young adults with hip pain . For further details on Dr. Barker, please visit: www.josephbarkermd.com or to schedule an appointment, please call: (919) 863-6808. Raleigh Orthopaedic is Wake County’s largest and oldest orthopaedic practice. The orthopaedic surgeons of ROC are fellowship trained in their respective subspecialty areas which include: foot and ankle, hand and wrist, spine, hip, shoulder and elbow surgery, total joint replacement, sports medicine, and pediatric orthopaedic care. Raleigh Orthopaedic offers comprehensive orthopaedic care including an in-office pharmacy, MRI (Magnetic Resonance Imaging), digital x-ray, physical therapy, hand therapy, orthotics, prosthetics & pedorthics, durable medical equipment such as casts, braces, splints, and an Orthopaedic Urgent Care, which is open weekdays from 1:00 pm to 8:00 pm and Saturdays from 9:00 am to 2:00 pm. In addition, Raleigh Orthopaedic provides sports performance training, sports physical therapy and nutrition services for healthy and injured athletes with the Athletic Performance Center. Raleigh Orthopaedic Surgery Center, a joint venture between Raleigh Orthopaedic and Rex Healthcare, is an AAAHC accredited outpatient facility featuring four orthopaedic operating rooms and two procedure rooms.